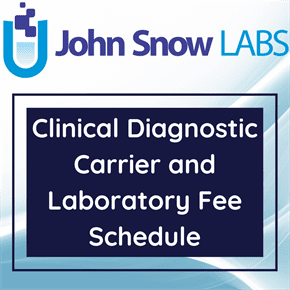 This dataset contains the clinical diagnostic laboratory fee schedule revised for January 2016. The update includes all changes identified in Change Request (CR) 9465. Outpatient clinical laboratory services are paid based on a fee schedule in accordance with Section 1833(h) of the Social Security Act. Payment is the lesser of the amount billed, the local fee for a geographic area, or a national limit. In accordance with the statute, the national limits are set at a percent of the median of all local fee schedule amounts for each laboratory test code. Each year, fees are updated for inflation based on the percentage change in the Consumer Price Index. However, legislation by Congress can modify the update to the fees. Co-payments and deductibles do not apply to services paid under the Medicare clinical laboratory fee schedule. Critical access hospitals are paid for outpatient laboratory tests on a reasonable cost basis, instead of by the fee schedule. Hospitals with fewer than 50 beds in qualified rural areas—those with population densities in the lowest quartile of all rural areas—are paid based on a reasonable cost basis for outpatient clinical laboratory tests for cost reporting periods between July 2004 and July 2006. Note: Where modifier is shown in the dataset, QW denotes a CLIA waiver test.The QW modifier states that the tests you are performing are “simple laboratory examinations and procedures that have an insignificant risk of an erroneous result”. They are considered “CLIA waived” and therefore require a “CLIA Certificate of Waiver”.